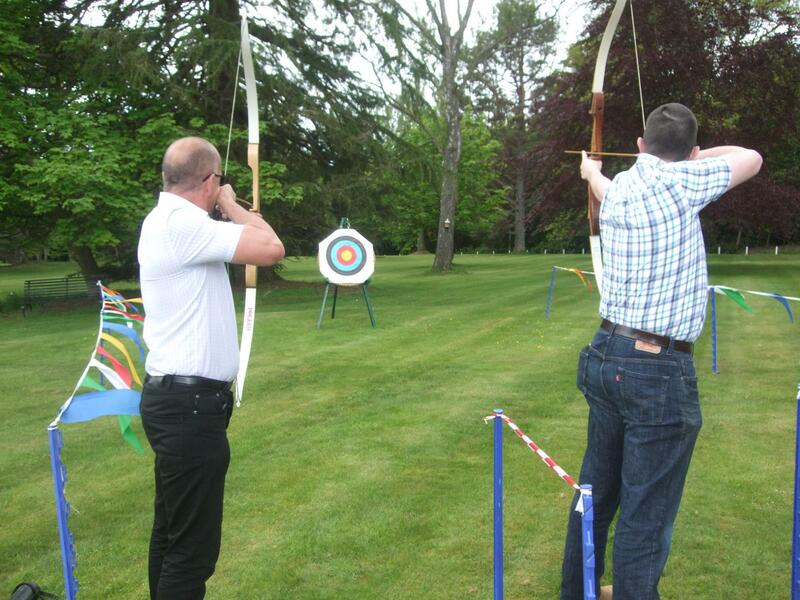 The beautiful Ardoe House Hotel in Aberdeen was the venue for Craig Group's Hawaiian themed staff, corporate fun day, BBQ 2014. There were beach balls, buckets and spades and seaside photo opportunities to be found setting the mood but it was the guest’s that really brought the theme to life dressing up in everything from Hawaiian shirts, to shell bikinis and even a gorilla! The entertainment for the evening included a Surf Simulator, Coconut Shy, Hoopla and a Limbo Challenge as well as Laser Clay Pigeon Shooting, Human Table Football, Bungee Basketball and the Longest Putt Challenge. It wasn't just for fun though as the guests were in six aptly named teams. We had; Kid Craig and his Coconuts, Club Tropi Cana Do It, 99 Problems but the Beach Ain't One, Don't Sand A Chance, Hawaii Even Try and The Beach Boys competing not only for the Team Challenge Company Winner’s Trophy but individual trophies for the top three in each activity. To start off the evening and get the teams warmed up we had the Limbo Competition. Kid Craig and his Coconuts started us off with 5 of the teams successfully making it under the limbo pole while some of ladies struggled due to the extra height from their heels. The men however, seemed to be professionals and Scott Leslie's shimmy under the pole was enhanced by the grass skirting round his wrists and ankles winning him the competition. 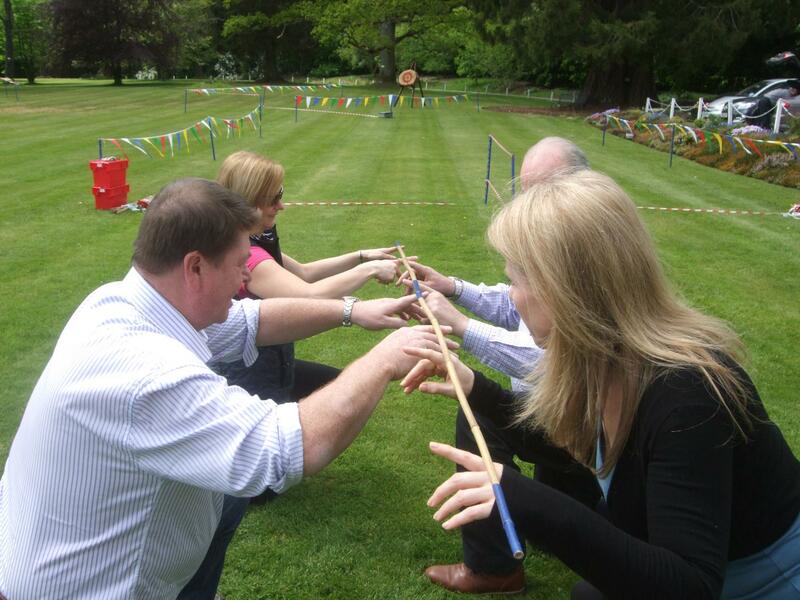 Laser Clay Pigeon Shooting and the Human Table Football were next up. The teams were full of enthusiasm for the football resulting in some very fast paced games that seen the ball out of the pitch several times but the ball also made it into the goals and Club Tropi Cani Do It just missed out to team, Don't Sand a Chance. Fortunately shooting also turned out to also be a strength for them and while 99 Problems But the Beach Ain't One struggled they scored a fantastic 7 points thanks to our winning shooter of the evening Daniel MacNeil. The Bungee Basketball also saw our teams score lots of points. Don't Sand a Chance managed 12 baskets and 99 Problems but the Beach Ain't One made up their points with 13 baskets thanks to Ian Ross and Kate Wielebnowska. The winners on the Surf Simulator managed to avoid the spectacular falls of some of the other guest and stay on for over a minute. Arlene Ross took second place with over 80 seconds while Ian Ross got first place with over 100 seconds. On the Hoopla, it was Anne Mearns time to shine while the Coconut Shy was the favourite of the evening with everyone trying their hardest, particularly the Beach Boys even if they weren't quite so successful, but it was Douglas Craig that proved to be the best. The final activity of the evening was the Longest Putt. Challenge. All they needed to do was score a hole in one. Everyone lined up for a go but it wasn't as easy as it looked and in the end in there was only one person who that managed, Ian Ross who took home the trophy. With all the activities completed and the scores collected it was time for Douglas Craig to present the Trophies. The first, second and third placed trophies for each of the activities were handed out first thanks to Rhona and her team who had found perfect trophies to show each one. Next was the, Best Individual Fancy Dress that deservedly went to Danielle MacNeil who had come as the Gorilla, while Best Department Fancy Dress went to the Crewing team. The final presentation of the evening was for the best and worst teams overall. In last place and taking home the Wooden Spoon were Club Tropi Cana Do It, living up to their name while the team of the night had to go to 99 Problems But The Beach Ain't One. A special thanks goes to Rhona and her team for organising the night, as well as Douglas Craig for his presentation and enthusiasm throughout the night, we hope everyone had as much fun as we did and we look forward to seeing you all again soon.